Fellow Tweedster Kristoph Jung and I recently had a conversation about Foo Fighters. He doesn’t care for the band, and though I consider myself a fan it is hard to begrudge his criticism. The now-ubiquitous rock four- and sometimes five-piece cracked the scene in 1995 with a strong eponymous debut. Solid songs like “I’ll Stick Around” and “Big Me” established the band as a gimmick-free hit machine. Their explosive 1997 follow-up, The Colour and the Shape, featured near-perfect rock songs like “Everlong” and “My Hero,” both of which give me goosebumps to this day. Then the band entered what I call a “beige” period, a quartet of inoffensive but largely unremarkable albums. To be fair, a few of them had their highlights. 1999’s There Is Nothing Left to Lose had the radio-friendly “Learn to Fly” and the talkb0x-tastic “Generator” (still one of my favorite Foo Fighters songs) as well as the cynicism and fat guitar of “Stacked Actors.” 2002’s One by One opened forcefully with the chunky “All My Life” but the rest of the album seemed like filler (including the yawn-fest single “Times Like These”). In Your Honor, released in 2005, is two discs of forgettable riff-rock. These albums decreased in quality to the point that even as a fan I didn’t bother with 2007’s Echoes, Silence, Patience & Grace. I can’t remember any songs from that album, including any singles which I’m sure were plastered all over Top 40 radio. Last year it was announced that Foo Fighters were recording a new album with former Nirvana and Smashing Pumpkins producer (and erstwhile Garbage drummer) Butch Vig. The result is Wasting Light, released this week. This new material was recorded in front-man Dave Grohl’s garage, eschewing popular digital recording techniques in favor of an all-analog process. This is, of course, exciting for music nerds and rock fans who grew up in the 90’s. Butch Vig is responsible for some pretty big records with big guitar sounds and big rock hooks. All-analog recording is preferred by many artists and can result in some interesting tones, adding surprising warmth to what is usually a sterile recording environment. I’m happy to say that the combination of Vig’s production, the analog process, and Grohl’s back-to-basics songwriting has provided a come-back album of sorts. Not that the Foos ever really went anywhere. Grohl discussed the recording of Wasting Light in several interviews, claiming the band and Vig had found the “heavy” sound they were looking for. I wouldn’t go that far. The album is only marginally “heavier,” in a chugga-chugga hard rock sense, than any other Foo Fighters release. (It’s no Probot.) But the songs are solid, mostly up-tempo, and more melodic than most of what you’ll hear on the radio today. Kristoph and I discussed Grohl’s “comfort zone” as a singer, his meat-and-potatoes range and sense of melody, which continues here but is augmented by Vig’s keen production ear. Guitar tracks are crunchier, beefier and more varied from song to song. (Mmm…crunchy AND beefy…now I want tacos.) Taylor Hawkins’ drums are tight and more energetic. And you can actually hear Nate Mendel’s bass! The songs are foot-tappers, make no mistake. Album opener “Bridge Burning” and “White Limo” perhaps best exemplify the “heavy” sound asserted by Grohl, the latter featuring a video with guest appearance by Motörhead’s Lemmy Kilmister. “Rope,” the current single, opens with a staccato, echoed guitar part and a “gotcha!” drum flourish before breaking into a stop-start riff and murmured vocals on the verses. Then Grohl breaks into his signature rock-n-roll shouty voice, carrying the song through a great singalong chorus. Grohl’s buddy and former Nirvana bassist Krist Novoselic lends his voice, bass, and accordion (?!) talents in a guest spot on “I Should Have Known.” The album’s final track, “Walk,” is likely to be its next single; it starts out low-key but builds into a relentless up-tempo screamer. If you are so inclined, the “deluxe edition” of the album, available as a download from iTunes and Amazon, includes a bonus track (the bouncy “Better Off”) and a remix of “Rope” by electro/house badass Deadmau5. The remix is quite a departure from the album’s rock roots, but Deadmau5 is so talented it actually ends up being a pretty interesting retro-electronic take on the song. Listeners thirsty for no-frills, unconceited rock n’ roll could do a lot worse than Foo Fighters. 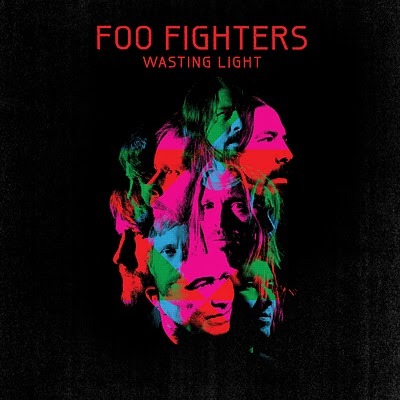 In short, Wasting Light is the band’s best material in years.